Our ace jib trimmer in practice at the weekend. Pretty much what it says on the tin. 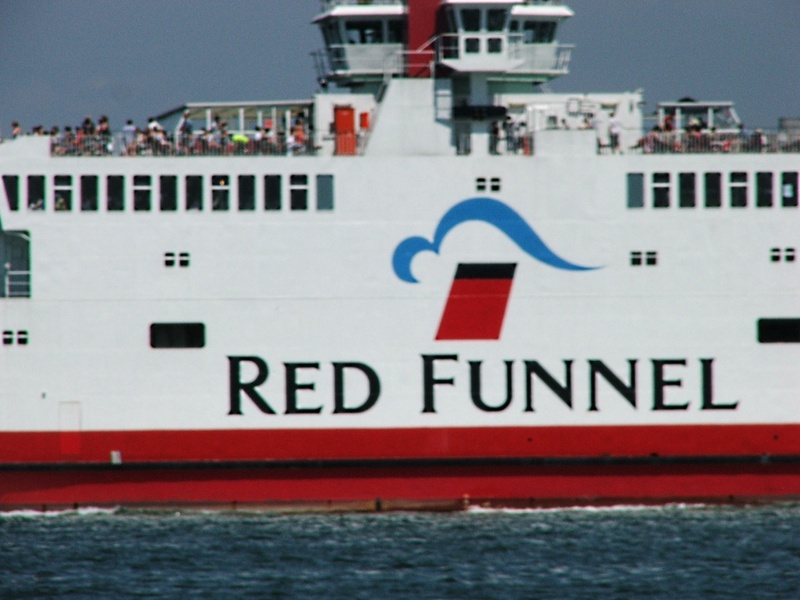 It was the hottest weekend of the year, the top deck was full of folks enjoying the short cruise over to Cowes. 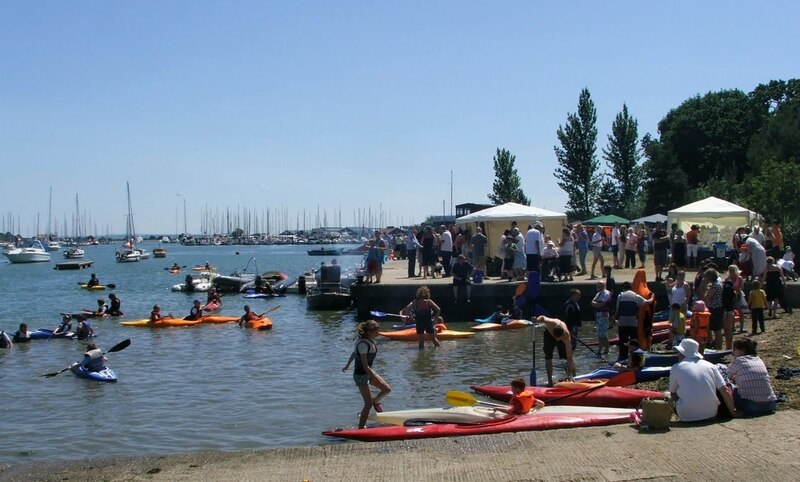 The hottest weekend of the year provided a great start to Hamble Week, a series of events and a regatta which dates back to 1868. The town quay and fore shore was predictably packed, with music, parades, a crab catching contest, a market and other attraction. The local Hamble Sea Scouts had brought along a load of canoes for their "Come and get wet" attraction. 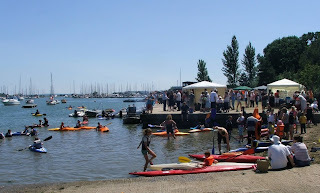 Sunshine and people having fun around boats, what else could you ask for! 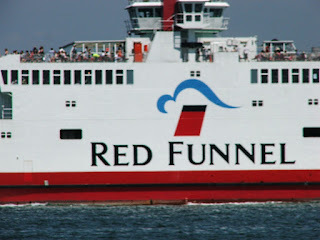 I don’t normally write much about other bloggers, but the Thames RAIDERS blog really tickled me as it’s got a historical and family context. 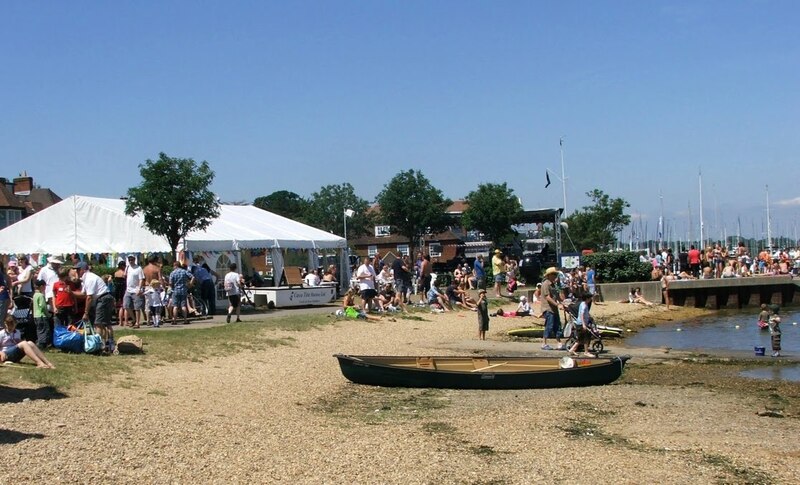 My Mum was a true cockney, born within the sound of Bow Bells before the War, she used to tell me about her childhood, when on Sunday afternoons they would usually have oysters, which had been brought up the Thames fresh from Brightlingsea and Whitstable. Back in those days and even back to Victorian years, oysters were a staple part of the Londoner’s diet. Several times a week sailing boats would come up the Thames to Billinsgate with tons of freshly caught oysters to supply demand. The trip under sail, especially with light winds would normally take two tides, the boats waiting out the ebb at anchor. 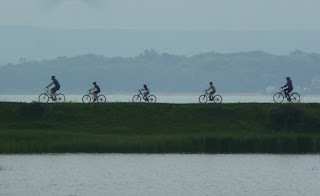 In extreme cases, with light or contrary winds, the trip could take as long as a week! Fast forward 70 years or so, and some of the leading catamaran racers decided to set a new record for the trip, sailing Olympic class - Tornado catamarans. 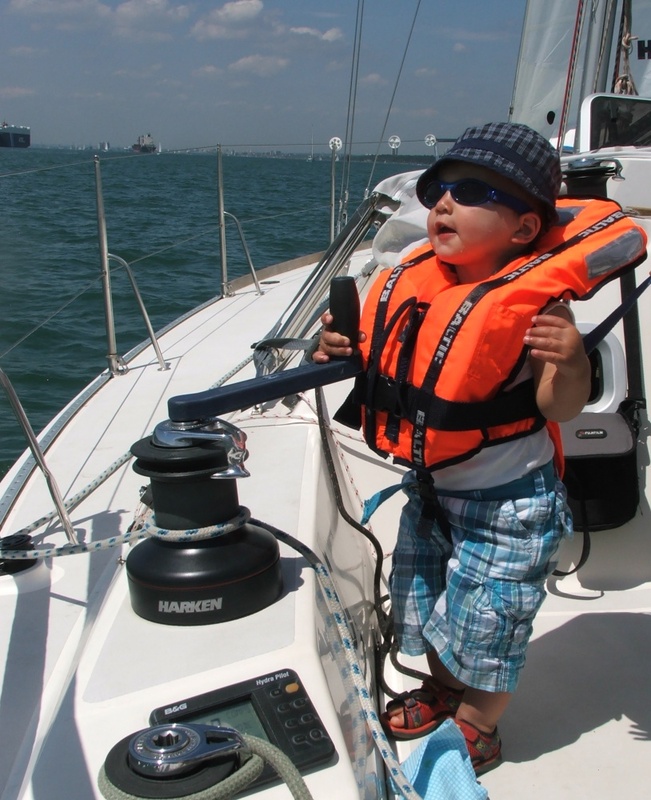 Shadowed by a rib and support team, they raced up the Thames 55 miles from Whitstable to St Katherine’s Dock. To qualify each Tornado had to carry 12 oysters (a bit les than the 100 tons which their forebears would have carried). Needless to say the cats did the trip a bit quicker, covering the distance in just over four and half hours at an average speed of 12 MPH. You can read about the second Thames RAID here, since then there have been trips to Ramsgate, Rye, Alderney, Cherbourg even a circumnavigation of the Isle of Sheppey. I wonder if I can persuade Erica that we should get a Tornado as a replacement for Greta? Like a lot of men, I really don't like shopping. Most of the things I want I can get on-line, so I don't see the need to go into town with the crowds and parking problems, besides which I can usually think of a dozen things I rather be doing. That said, Erica has been wanting me to help her choose a couple of chairs and look at rugs and a few other things for the house; which means a trip to the shops, one that I've been putting off for a few months. 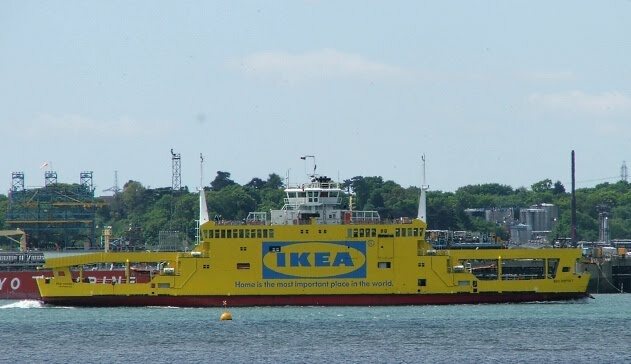 Fortunately I'm really not that bothered about football (that's the game with the round ball) so we took advantage of Friday's England - Algeria game in the world cup to go to IKEA. 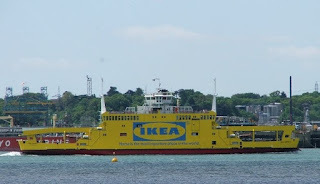 It was great, the car park was empty, and even though we have to walk all around the winding IKEA store, it was empty. Even the restaurant was empty, so we all had meatballs, before leisurely paying at the check out, no queues, no crowds, that's how shopping should be!! And from what I hear, I didn't miss much, not seeing the match. 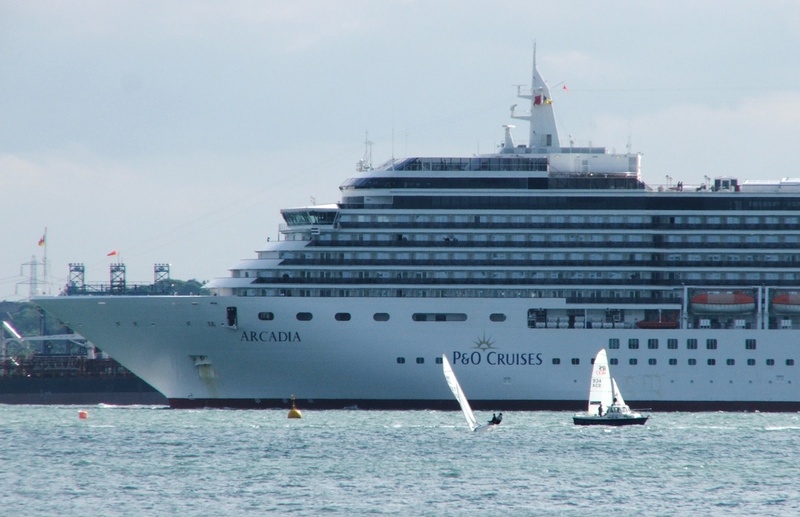 It was a change over weekend at the cruise ship dock in Southampton, and the late afternoon high water was ideal for an early evening departure. 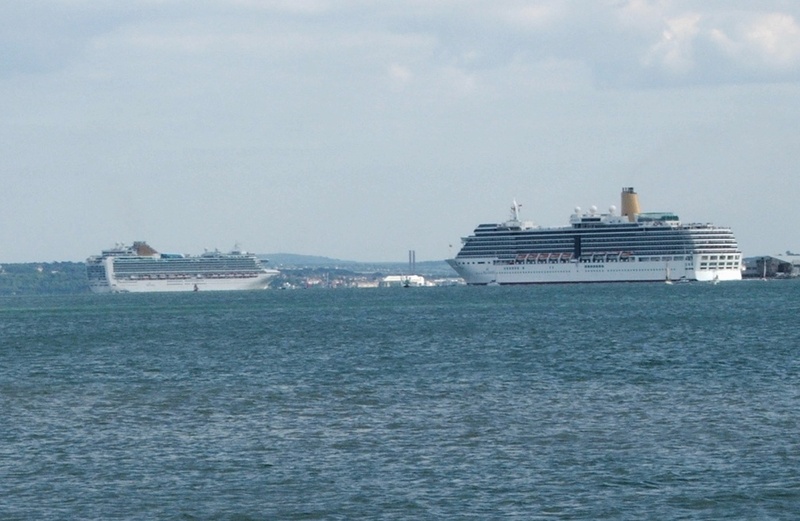 It must have been a busy day as no less than four ships departed on the tide. Below, the ship on the left of the picture has turned west around Calshot Spit buoy, while the one on the right is heading south down Southampton water on it's approach to Calshot. 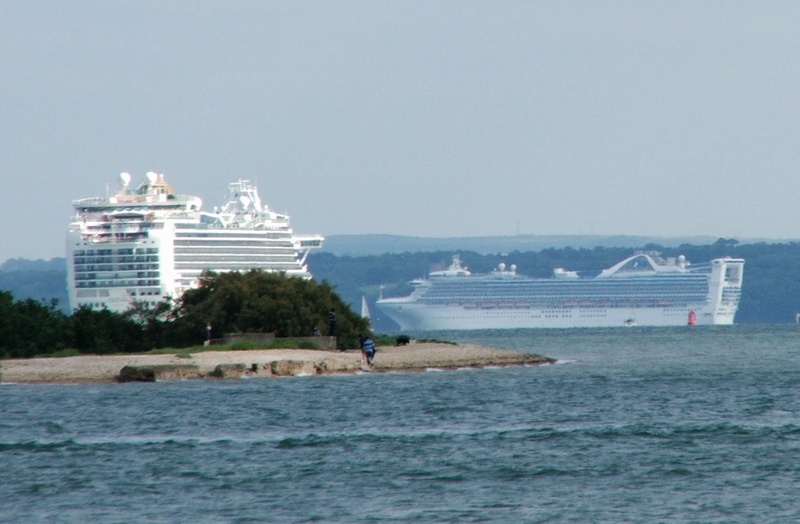 Yet another liner (below) makes the turn around Calshot slightly obscured by the Warsash fore shore, while in the distance a forth ship heads eastward, along the Solent near to Cowes, having completed the winding "S bend" channel which avoids the Bramble Bank. 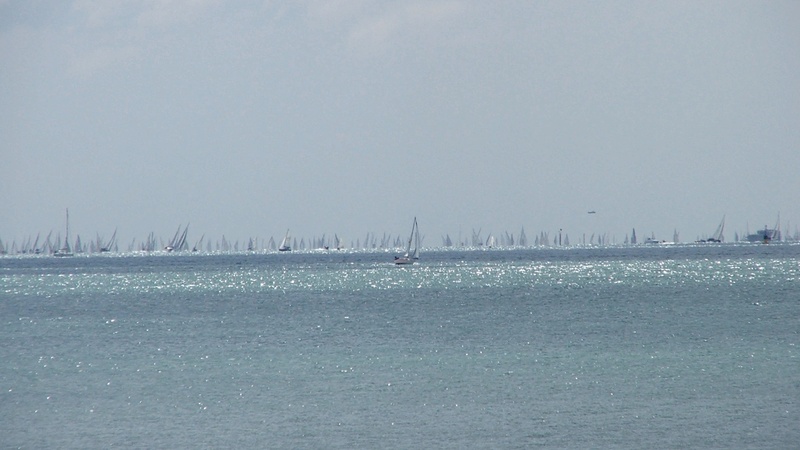 Today was the annual Round the Island Race, when 1800 or so yachts of all types and sizes race around the Isle of Wight. 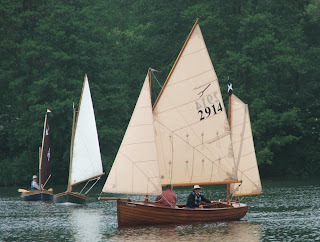 We got up far to late for the start, which kicks off from around 6.00 AM onwards with the various classes staggered to improve the racing and to avoid problems with some of the bigger and much faster boats. Here (above) late morning, the main fleet is rounding Seaview and the No Man's Land fort off the north eastern end of the Isle of Wight. 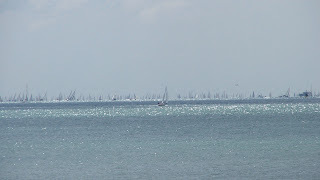 They had already sailed west from the start off Cowes, around the Needles and south off St Catherine's point at the bottom of the island, this was the start of the home stretch back to Cowes and the finish. 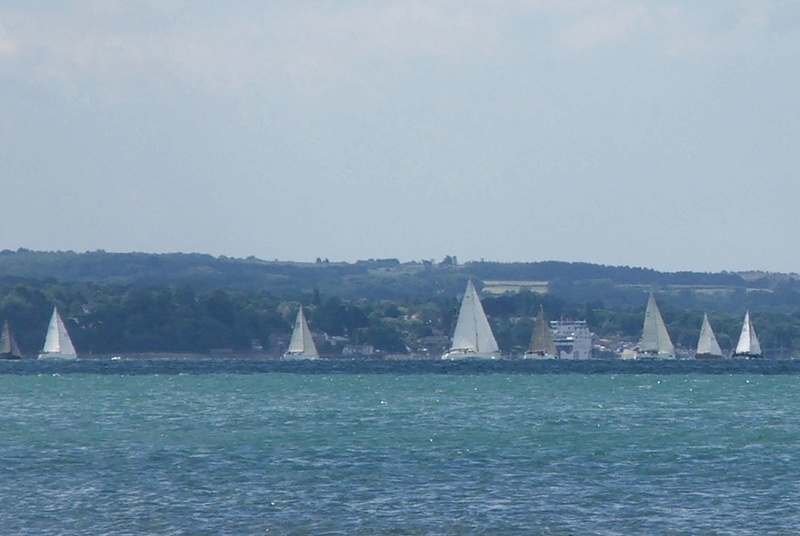 Sailing close to the Wight shoreline, past Wootten on the final leg. 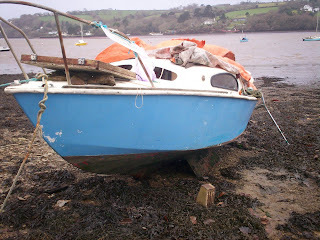 Here’s Greta as I left her at the yard last week, Her mizzen mast, boom, gaff and bowsprit had all be taken down. 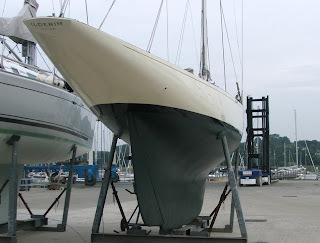 She was waiting on the crane, ready to have her mast taken down and then be loaded onto a truck and driven off to her new home on the east coast. 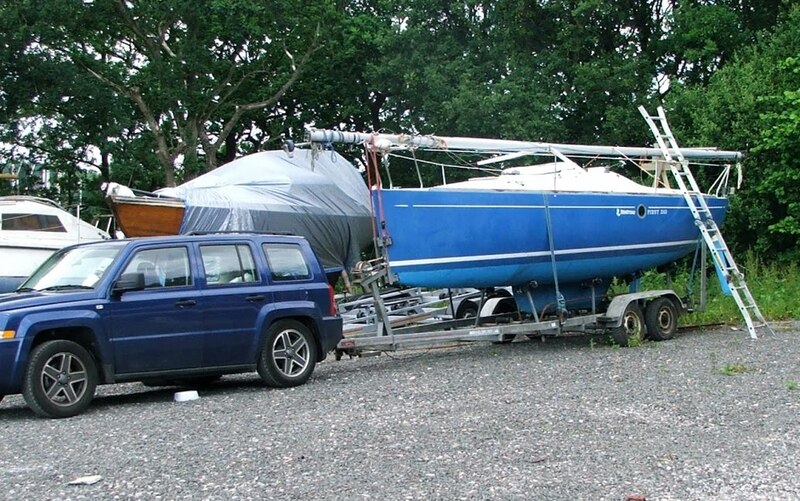 I’d put her up for sale thinking that it might take a while to find a new owner, but she sold within 2 weeks. Our problem is what next? While speculating on what type of boat to buy, we struck up a conversation with a couple in the yard, they had just sold their delightful gaffer Curlew. and bought a First 210 as a replacement. It’s a very appealing idea, a simple, fast and easy to sail sports boat, which can also be trailed long distances at motorway speeds to a holiday destination. It's got me thinking – watch this space. 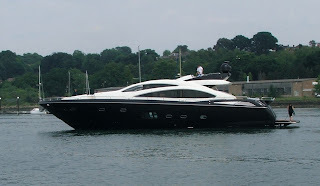 I'm not a fan of motor boats generally, but you can't help but admire some of these big and flashy cruisers. You can get a sense of scale by looking at the skipper and the crew. At seventy two feet, getting alongside the dock in what is a crowded marina isn't for the faint hearted. 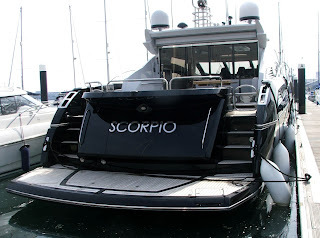 This season's colour scheme seems to be black and chrome, with just a hint of art deco. I'm not sure if this is an 8 Meter class (which somewhat spoils the title) but she was very definitely designed to the meter rules. 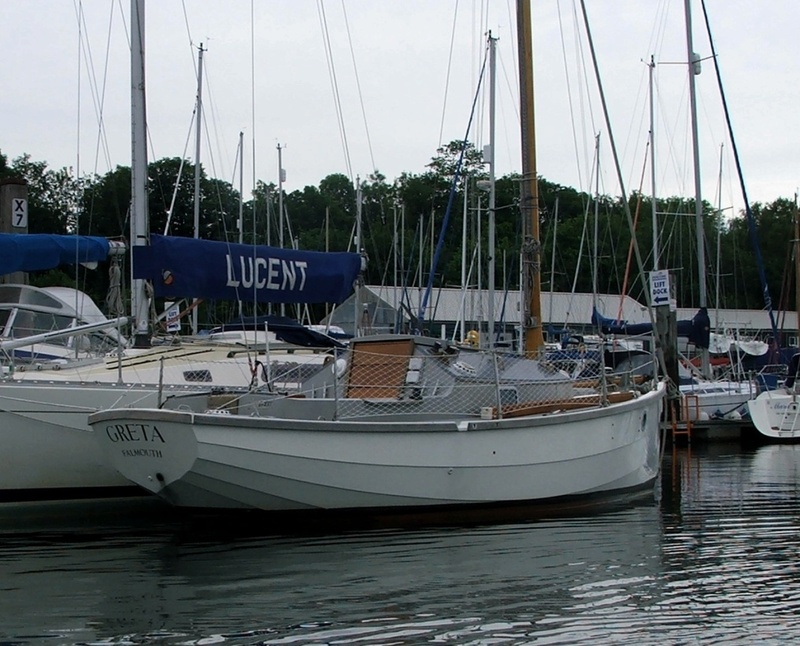 Her name is Ilderim (presumably the sail cover is from another boat), designed by Tore Hold and built in 1936 as Sweden's Olympic entry. The games were held in Keil and Ilderim finished first overall. 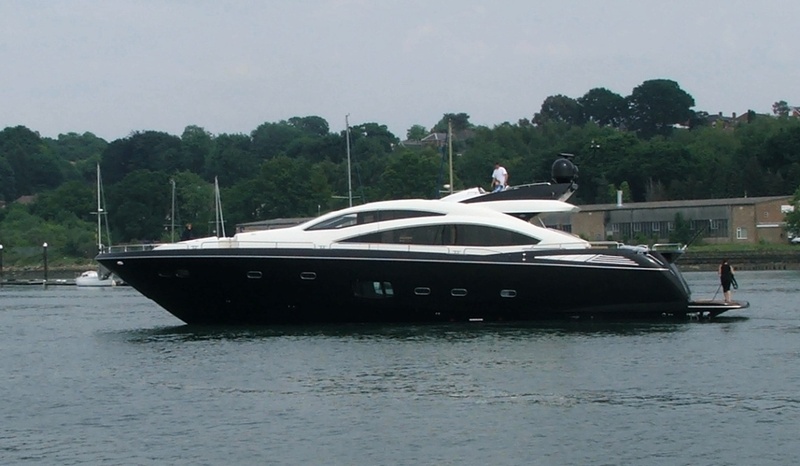 Look at those fantastic lines, you can imagine her slicing through the water and leaving just the slightest ripple. As the Solent season swings into gear, starting with the Around the Island Race on June 19th, hopefully we will see her out on the water. 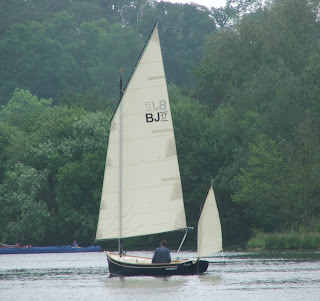 On Sunday we drove up to Pangbourne on the River Thames where the Beale Park boat show is held. I had forgotten how beautiful the river is, the quintessential English river winding it's quiet way betweens the lush green hills of the Thames valley. Most of the exhibits were small sailing and rowing craft and there was just enough wind to keep a small fleet active on the lake. 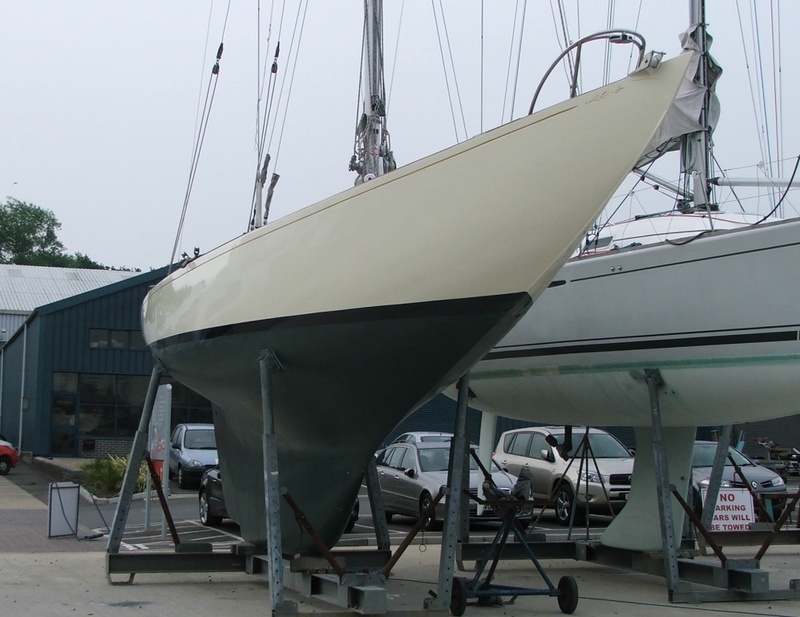 One of my favourites(above) is the slightly unfortunately named BJ17, designed by Nigel Irens and built by a Dutch yard Jachtbouw Bart Jan Bats in Zaandam she's very much in the spirit of Roxanne and Romilly with high peaked lug sail and carbon spars. 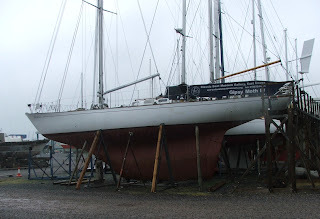 Despite the rain, I had to jump out of the car and take a photo of Sir Francis Chichester's famous yacht Gypsy Moth IV on the for sale lot at the Berthon yard in Lymington. 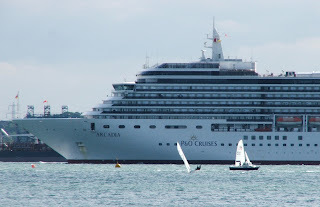 I can remember my family's excitement following the single handed circumnavigation and the arrival of Sir Francis to a hero's welcome back in the 1960's. 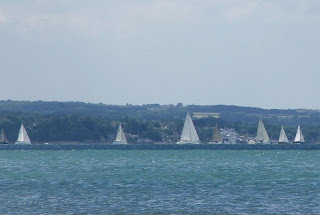 We were fortunate to be invited aboard Gypsy Moth just after her restoration in 2005 and to watch her racing off Cowes with her contemporaries Suhali and Lively Lady. 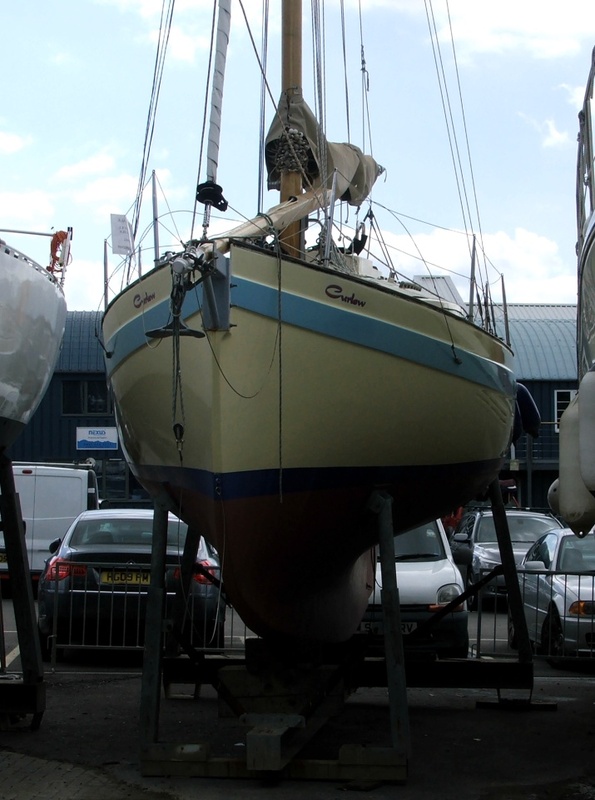 Gypsy Moth has had a bit of a checkered history, apparently Chichester didn't like her much, although she did the job for which she was designed. She was set in concrete for 25 years in Greenwich as a rather sad monument. 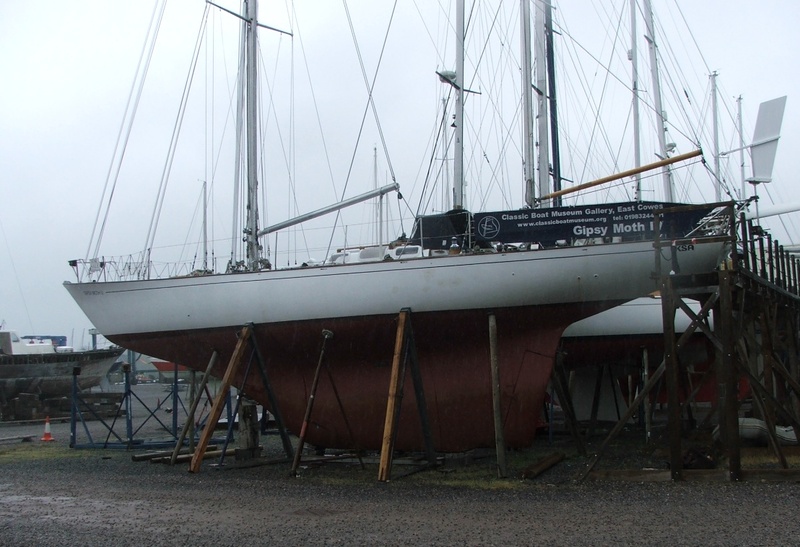 Restored in 2005, she set sail on her second around the world voyage only to run aground on a reef in the Tuomotus, known as The Dangerous Archipelago. Lets hope she goes to a good home. 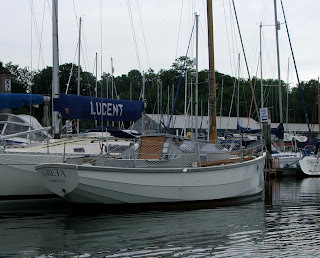 David and Dianne Fincham read my post about Post War Classics and very kindly sent me photographs of their Robert Tucker Debutante Mk I which they sail in the Fal estuary in Cornwall.
" 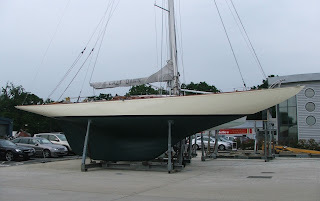 I think ours was built in 1960 and since then has spent a lot of that time in Cornwall, she has had a complete overhaul and is in excellent condition, her sail/build No is 24,named "Debeneau" is 21ft long with a 7ft beam, She is easy to sail and provides lots of below deck room with comfortable bunks with ample storage. 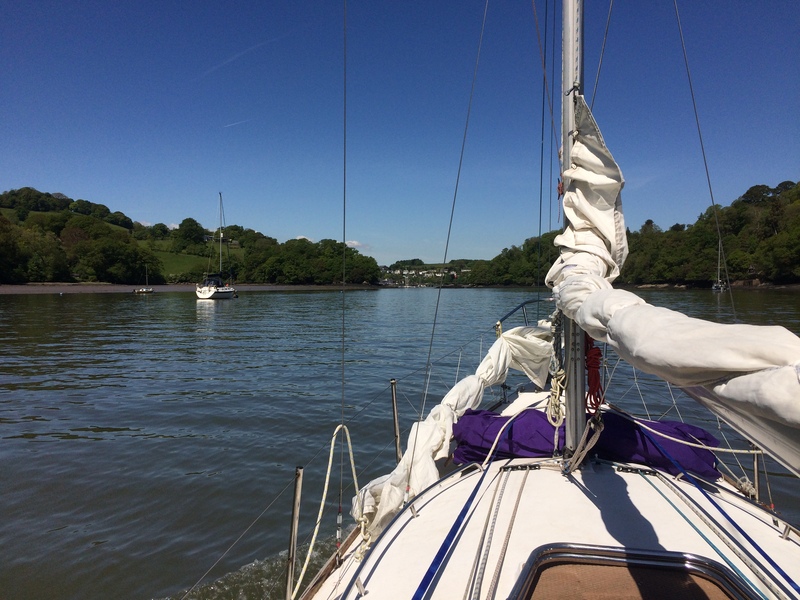 we sail mostly in the Carrick Roads, local rivers and creeks, being a bilge keeler draws only 27ins and 300 lbs of cast iron centre ballast keeps her nice and solid when she takes the ground. One of these delightful Débutantes, apart from being the first small vessel to hold a "JOG" certificate, holds quite a few WORLD RECORDS, achieved by Triston Jones on his boat called Sea Dart, his adventures aboard her are documented in his book 'The Incredible Voyage'"
She is certainly in nice shape, but if you have read this blog you will know I have a thing about yellow boats, plus she is ideal for sailing those delightful waters. David also has another project boat a Tucker Silhouette. He comments "A couple of photos included of our Silhouette project, this little yacht is also a classic although ours is a Fiberglass Mk11, The wooden Mk11 is what the moulds were taken off, at 17ft 3ins in length and 6ft 9ins beam this little classic bilge keeler is sheer enjoyment, she will go anywhere and has done many North Sea and Baltic trips as well as Atlantic voyages." Thanks to David and Dianne for taking the trouble to share this with us.